we're taking two of these instruments and making a fancy Jimmy Page-style guitar. First, we're replacing the masonite top with a thicker, bird'seye maple top. making one right-handed and one left-handed. 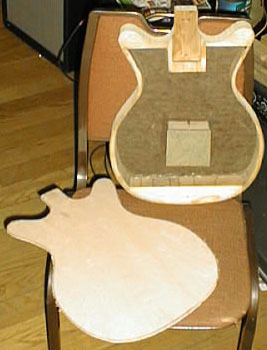 instruments and have shaped them to the customer's hand. even Vox-style and other peghead profile necks out of them. Another one you'll see shows my coke-bottle peghead with a Brazilian rosewood veneer. In the 60s Danelectro used alot of Brazilian rosewood pegheads, and since I love the look of the wood, I do this just for my own traditional interest. 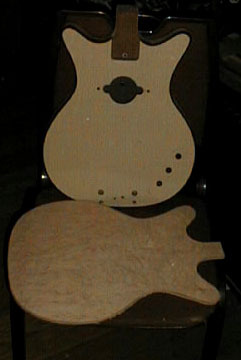 The last one shows the walnut veneer over the back of the peghead, for extra strength. What's interesting is you see the stripe down the center of the neck where the quarter-round router bit did the first shaping pass in the Danelectro factory. The rest we do by hand -- rasping and sanding. On top of a thick rosewood fretboard, Danelectro used a really good jumbo fret wire, which we crown and polish. The guitars are completed with upgraded appointments, such as a non-trem strat bridge and high-quality tuning gears, which allows the instrument to play in tune and STAY in tune. The sound block under the bridge cuts back on any feedback and gives it a great 335-style tone -- good for blues and funk. 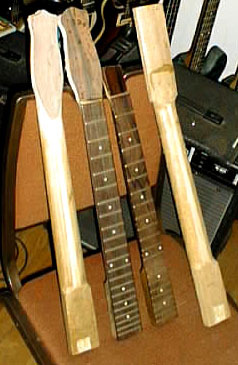 Another interesting point is: working with these instruments for 34 years, every now and then people trade a piece in that I worked on, or Mike Stevens, or Lary Jamison worked on in the 60s. We just love the customizing of these guitars. On the Danelectro Subway stop you'll see other Danelectro custom creations from the past years.